"Growing up, my Mom used to make barbecued beef in the crock pot and it always tasted so good. It's definitely comfort food for me. After I got out on my own, I was determined to make barbecue beef just like hers, so I tried lots of recipes and finally came up with one of my own. I was so pleased! I called her to tell her and she laughed. She had always just used a bottle of barbecue sauce! We still laugh about that and now I've had to give her my recipe!" 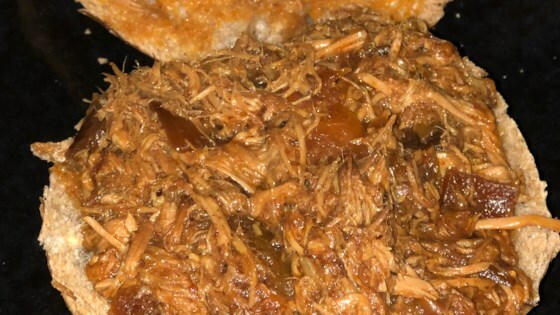 Combine the onion, brown sugar, pepper, salt, chili powder, paprika, oregano, garlic, ketchup, water, white vinegar, canola oil, Worcestershire sauce, and liquid smoke in a slow cooker; stir. Lay the beef pieces into the sauce. Cook on LOW for 10 hours. Remove the beef from the sauce, keeping the sauce in the slow cooker, and shred with two forks. Remove 1/4 cup of the sauce from the slow cooker and pour into a bowl. Whisk the cornstarch into the sauce; stir the mixture back into the slow cooker. Add the shredded beef; stir. Serve hot on the whole-wheat buns. The meat got really tender and juicy, but the flavor was terrible. Way too sweet for a beef dish. Had to rinse the meat off and add some bbbq sauce to the rest of it. Very good. I'm not very experienced at all and found this recipe very easy and the family loved it.